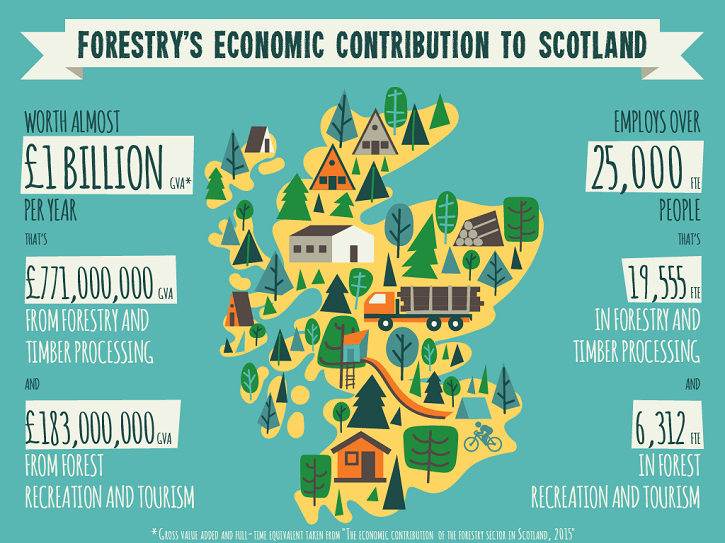 The Forestry Commission are the government body assigned to promoting their sustainable management program – for Scotland’s economy, people and environment. They are the real unsung heroes of Scotland, and our aim was to show the public exactly why they are so important. 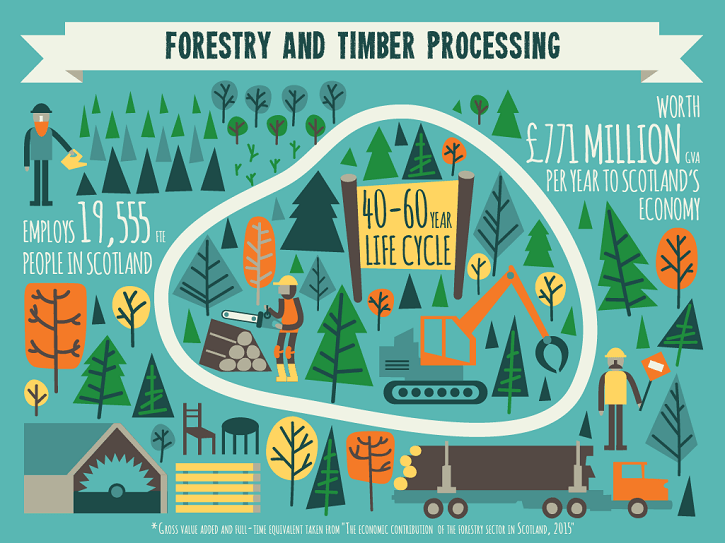 A nice bit of green is just a fraction of what the Forestry Commission contributes to Scotland. They bring in nearly £1 billion GVA to our economy each year, provide an incredible 25,000 sector jobs, and are leading the charge in environmental protection. We were sold! We needed everyone to hear their story. What we wanted to do was highlight the contribution of forestry, easily, and quickly, without having to refer to jargon-packed, figure-dense reports and governmental policy. Challenging, yes. But we love a challenge. Tasked with presenting the reach and breadth of the sector, we at Muckle Hen wanted to focus on the dynamism of Forestry in Scotland, and that it isn’t all just about trees. Using an earthy palette, the animating team – Alex and Oana Nechifor – created a beautiful flowing 2D animation to highlight the different aspects of the commission. Scotland’s natural environment played a key role in this animation, it is the relationship between the characters and said environment that stands out. From timber to tourism, or construction to canoeing, we used a mixture of commercial and recreational activities to communicate the idea that we are all intrinsically interlinked to the industry. The complexity of figures is always a drawback when making a film like this. Especially when dealing with an economic strategy. 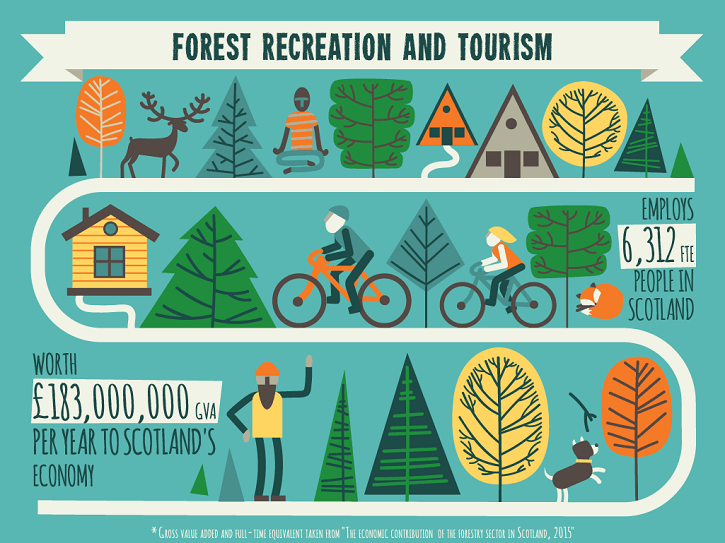 To combat this, we incorporated the figures into the animation itself, showing that even though the Forestry Commission sometimes goes unnoticed, they are still at the heart of what makes Scotland great. Upon the first screening we totalled 5,000 impressions within a couple of hours of the launch. Specifically targeting MSPs and related organisations, this demographic made up over 60% of interactions. With over 2000 views on Youtube within 3 months, the film has become an integral part of the Forestry Commission’s implementation strategy. Our film for the Forestry Commission is hands down, one of our favourites. Not just because the end result was truly spectacular; not just because the people at the Commission are super-super nice; (here’s looking at you Vonny!) but because it is a vital industry that makes Scotland, Scotland.